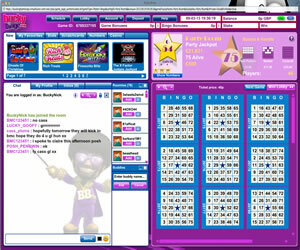 When you first visit Bucky Bingo the home page looks a little dull in comparison with other brands available online with the main banner scrolling through the latest promotions and then a selection of images promoting slots and bingo available. There is nothing that really catches your eye to make you want to register with the brand, unusual for a Virtue Fusion product. 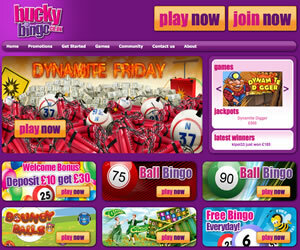 Betfred Ltd acquired Bucky Bingo in March 2011. It's clear to see the ownership with the similarities between the two brands. 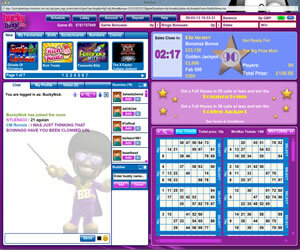 Bucky Bingo was originally the online arm of land based clubs Buckingham Bingo but Castle Leisure/Club 3000 who purchased the offline arm of the business had no interest in the online side of things. It takes no time at all to register with the brand and within minutes you are ready to play at Bucky Bingo. The lobby is the main hub of all the activity and this is where you will find the game offerings. 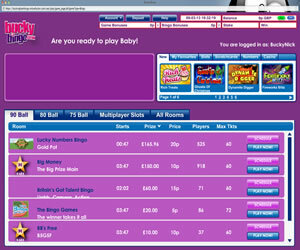 There are several tabs to choose from; 90 ball, 80 ball, 75 ball, Multiplayer Slots and All Rooms. You will find an abundance of information to help you choose a room that suits your budget and game requirements from the room name to the jackpot of the next game. When you enter any of the rooms you will find that the layout is the same as with all other brands on the Virtue Fusion network using the same software. Navigation around the gaming screen is simple and easy to follow. Purchasing options appear over your bingo cards with a slider or quick buy option. As well as the main bingo offerings you will find that Bucky Bingo is home to popular themed games like The Bingo Games, Lucky Numbers Bingo and Deal or No Deal Bingo. Additionally there are also multiplayer slot games on offer, games where you compete with other players to score the most points as well as spin in big wins to improve your cash balance. Bucky Bingo doesn't really stand out from the crowd with unique promotions or offers but if you love the Virtue Fusion gaming experience then you are sure to feel right at home at this site. Featured weekly promotions include a variety of Bingo Linx games. Bucky Bingo offers several different variants of the game online; you will find 75 ball in two variants (line and pattern) and 90 ball bingo. You will also find themed games like Deal or No Deal Bingo, Lucky Numbers Bingo and The Bingo Games at Bucky as well as the card based game, Joker Jackpot. Additionally the site offers a huge array of instant win games like popular games Clover Rollover and Lucky Ladies 88. There are no specific wagering requirements on the first deposit at Bucky Bingo simply because you are required to spend your initial £10 deposit on bingo tickets before the £30 free is credited to your bonus account.